This is not a review of Bleak House , per se, and it shouldn't be read like one. I've kept Reader's Diaries in the past when I'm reading classics that are 500 pages or more, just to kind of keep track of my impressions of the book as I go along. Since it's a classic, and the large majority of the population either knows or should know what the basic plot is, and as these types of books have been written about by hundreds of people who can critique the work better than myself, these diaries are more for me than anything else I might blog about. Mostly, I'm taking note of the fact that I read the book. That said, proceed with caution. Day 1, July 23rd: Read enthusiastic comments by xwroz on this post which made me feel less apprehensive about reading Bleak House . I decided to bravely launch into it that very afternoon. Five chapters later, with nary a confusing sentence, I found myself smirking at Dickens and being horrified by myself for feeling horrified by this book that very same morning. Day 2: Read Chapters 6-11. I also confess to having chortled with laughter over Mrs. Pardiggle's exclamations of her hard working character. "Well! I freely admit it, I am a woman of business. I love hard work; I enjoy hard work. The excitement does me good. I am so accustomed and inured to hard work that I don't know what fatigue is." Day 3: Took a break. On accident. I just didn't have time to get to the book! Realized that Dickens is not a good author to take a break from. It's better to read even just one chapter a day than ignoring it completely. I had to re-read the last few pages from Chapter 11 to get back into the swing of things. I think Dickens' writing style is very odd and unique. (Well, obviously...) He is quite generous with his semicolons and it always gets me when he starts writing as if he is jotting down a screen play instead of telling a story. Sometimes it feels as if I am reading a play before I am thrown back into the story. He's a very unique combination of writing styles. Ok, we've got to be happy about that! The progression of pages. Day 6: Read Chapters 17-?? And herein the diary aspect fell apart. My mother moved to town (I keep saying this, but it did effect things!) and I took multiple days off. I finally got back into the swing of it around August 8th or something. On August 13th I was beside myself, feeling like I was always 100 pages away from the end. Always and always a hundred pages to go! But soft, what light through yonder window breaks! I finally finished reading Bleak House on Tuesday, August 14th. At 4:53 p.m. precisely. And every day afterwards I have rejoiced. Now, if you recall, I read Bleak House because it was chosen by my local book club for the month of July/August. We have not, at the point of this post, been able to meet to discuss the read. I really should not be posting about this just yet. Normally I wait until after book club is over so that I can solidify my thoughts which might include changed opinions after hearing the perspectives from the other readers. However, in this case I'm going to go ahead and post my "diary" because I finished it before every other person in the club (minus one other dedicated soul)! Yes, my friends, I strained at the bit to complete this book before our allotted day for book club only to discover that no one (excepting one other) had finished the book and our meeting day as been set back several more weeks. Truthfully, I have no intentions of solidifying my thoughts about Bleak House in any particular direction until after our book club meets. 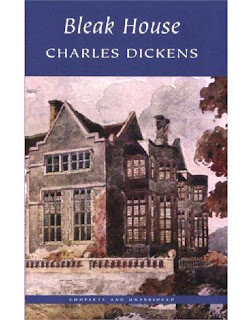 But for now I will say that I liked it, I'm glad I read it - mostly because it removed my personal fear factor when it comes to reading Dickens - and I enjoyed it. Perhaps it was my early exposure to Dickens that let to my love of the semicolon. It really is delightfully useful. This is one Dickens novel I have not read, but I think it will be my next one. Well, I am glad you no longer hate Dickens! Since I like him, I'm pretty sure I'll like this book since you do. I don't know when I'll get to it. Somehow I only became recently aware of this one, though I've read most of his other books. This one will remain off my choice of books to read...though I am happy to try The Christmas Carol for book club. I believe Dickens was a bit irritating in high school...Great Expectations. Maybe 8th or 9th grade? 11th? Don't know. I commend you for finishing this hefty book so quickly! I haven't picked up Les Miserables (which I actually LIKE) in a couple of days. . . sigh. Now you just need to watch the miniseries! I've never read this book and have no clue about the story. The only Dickens I've read is The Christmas Carol so I commend your success at reading TWO of his books! wxroz - ARE YOU NEVER TO BE SATISFIED?!?!? ;D HA! Haha, I felt I had to say something! I'm glad you don't hate Dickens! He is quite verbose but one of my enjoyments is that many of his characters are individual and memorable! I've been trying to catch up on all the blogs I missed while out of town and I've been harboring this one up because I knew I would enjoy it. It was everything I dreamed and more. In case you didn't already catch on to how gleeful I was over you changing your mind: YAAAAAYY!! If that isn't obnoxious enough I can add a few more "A"s and "!"s. Oh man Mrs. Pardiggle and her children are horrible AND crack me up! I didn't like Skimpole either. Ahahahaha! You and the other busy bee in the club ought to be awarded a medal. I think you should definitely be allowed to gloat. Yay! I'm so glad you liked it! I read David Copperfield this summer, also very long but in the end I found I liked it a lot!